My life has always been governed by routine and I suppose that is true for most people despite what they may say to the contrary. Routines are one thing and plans another. My life is also governed by plans and yes, probably everyone else’s are too. We all make plans in life. Plans are the promises we make to ourselves but sometimes don’t receive or carry out. After a complete rest on Sunday I was ready to resume the routine of working on my plan, a project I had given myself (like all the others) to fill a portion of my days with something to do but something else had to be done first. I had to have my six-monthly appointment with the doctor for check-ups and prescription renewal. I planned to do a little shopping after the appointment and then do a couple of other errands before returning home. The appointment was for 0910 but as is usual I didn’t get to see the doctor until twenty minutes later. On leaving the surgery I walked into town to purchase a few things one of which was a blood pressure monitor before returning to my vehicle to drive home. According to my doctor my blood pressure was again just as the previous time very high. On that occasion I had subsequently been loaned a monitor to carry out the tests at home and they proved my blood pressure wasn’t high at all. The doctor suggested I might purchase a monitor or have another check-up by the chemist. I chose to purchase one so that I could take several tests and submit them to the surgery. Later at home my tests showed once more that my pressure levels were not high at all. I told the doctor that my results were always high when I visit the surgery. Now I suppose the reason for that is I don’t find it easy to relax at the surgery. I took my purchases home and immediately drove off again to dump some rubbish and unwanted items at the waste recycling depot returning home via the builder’s depot to purchase granite dust and cement. It was lunch time when I got home and after lunch I didn’t much feel like working but did a little plastering in the cellar storage room. The day hadn’t turned out anything like I thought it would, it had been totally disrupted. I thought later that I should have concentrated on installing the replacement shower cubicle glass instead but there was always tomorrow. 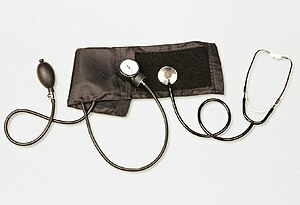 Every six months I arrange an appointment with my doctor for a check-up, specifically to have my blood pressure monitored. Up and until a couple of years ago I underwent regular blood checks for lipids also but for one reason or another those checks lapsed. That was partly my own fault I know but the surgery should have reminded me too. As I take hormones I have to watch my cholesterol levels, hence the lipid screening. At the same time and in order to keep my cholesterol levels down I have to be a little strict in my eating habits, low intake of dairy products for instance. Now due to the fact that I’ve not had any blood checks for around two years I basically forgot about my health in that respect. A case of out of sight out of mind I suppose. Consequently I have allowed myself to slip into bad eating habits by consuming more of those foods I should be steering clear of! On Monday I had an appointment to see the doctor to arrange for a repeat prescription and expected and received a blood pressure check. I get six month’s worth of hormones to save the need for frequent visits to the chemist (drug store). The doctor brought up the subject regarding blood checks and I have now been put back on track so to speak. Since my old doctor retired over ten years ago I have been attended to by a number of different doctors at the practice but not all of them were shall I say too conscientious with regard to my blood check-ups. This new doctor whom I have been seeing for a few months seems to be more on the ball. Having arranged for my prescription to be repeated she took my blood pressure, which was high, and she arranged for a blood test. At any rate she has reminded me to take more care of what goes into my mouth too and not to wander from the path I should be on. With immediate effect I began to put my diet back in order and at the same time increased my exercise regime, not that I really lacked in that department. Happy days. What’s so healthy about a Mediterranean diet? Yesterday, Monday, I had an appointment with the nurse at the doctors’ surgery. It was a routine check on my health because of the medication I am taking, estrogen. This time it was simply to check my blood pressure. It appears that the systolic pressure reading is too high. It’s my own fault really because lately I have to admit to not exercising as I should and of course being a little ‘lax’ with my diet. I will get it all under control before my next appointment in one month’s time. Whilst I was waiting in the surgery with my tag in my hand I noticed the guy sitting nearby had a black coloured tag, mine was silver. The system they use in the surgery is to give each patient a tag depending on which doctor or nurse they are seeing. That means nine different coloured tags. A display board shows the colour associated with each doctor/nurse and when the buzzer sounds and the relevant light is illuminated then the next patient makes their way to the appropriate room. The tags are numbered so that the patient will know if it is their turn. When it is your turn you place your tag on the relevant hook beneath the board and proceed to the room. It sounds complicated but it is very easy and almost fool-proof. I smiled to myself when I saw the guys black tag because the colour is assigned to the Midwife! LOL. I still can’t figure that one! About an hour and a half later I had another appointment with the dentist 21 miles away but before I drove there I had to buy some flowers and pay a visit to a woman I know who has just returned home after having a brain tumour removed. She works in the kitchen as a chef in my local pub. It was less than two weeks ago when I last saw her and when I was in the pub on Saturday night I learned about her illness for the first time. She lives about two and a half miles from my house in the direction I was travelling to get to the dentist so it wasn’t out of my way, not that that would have made a difference but I had an appointment to keep. Anyway she was up and about and let me inside for a few minutes to speak with her. When she told me what they did to get at the tumour I was horrified! It appears that they peeled the skin down from the top of the head to gain access to the skull and then replaced it as if pulling back a blanket on a bed! Absolutely amazing and the only real damage is temporary bruising and water retention swelling. She looks remarkably well after such an operation but she is still weak. I left after five minutes so that I could make my appointment with the dentist. Last week I had a tooth removed and this time I was to have preparatory work to ‘cap’ another tooth which I will get done next Monday. Although the dental work is covered by the NHS I am still having to pay £204. Just imagine what it would cost if done privately! So that is another appointment for next week. As the journey to the dentist is over 21 miles I was beginning to need the toilet on my arrival there. Another woman beat me to it and was waiting outside the only toilet’s door. We stood there laughing at our predicament along with an old guy who was sitting nearby. After an embarrassingly long wait the old guy said,’Did you try the door’? The other woman was reluctant to do that so I stepped over and discovered the room was empty! I had assumed that she knew that someone was inside. What a laugh! Monday evening saw me at the pub having a good time. Not many ‘regulars’ there but I wasn’t bothered (where have you heard that one before?). I spent time reading the newspaper whilst sitting on the most comfortable leather couch. Later I had a meal and then some more drinks, actually I had purchased a bottle of red wine so I finished the bottle. Naughty girl I am sometimes and that won’t help my blood pressure but I am not worried about that, I will get it under control as I said I would. I met with a couple of people but by and large spent most of the time alone. I sometimes welcome that.